WeetHet - Video - What is a VideoServer Plugin? On this page I will try to explain te concept of so called VideoServers. VideoServers has a pretty heavy name but the concept and setup of a VideoServer is much less complicated as one would expect. Forget about the "Server" part of the name. It's just a great plugin that helps you linking Video applications to standalone video-conversion tools. Server in this case means an application (on the same PC) that offers a service to one or more applications. The explanation on this page is based on the very good "Video Server Plugin" by Videotools.net. Request: Support the author. He is offering this plugin for free, but if you plan to use the Video Server Plugin, then please consider registering/donating for the use of it. This can be done using PayPal. Edwin van Eggelen has put a lot of effort in it ... I personally think he should at least receive a little reward from it's users. Note: Don't forget to read the disclaimer! Naturally I could go into highly detailed technical information, but I not. The Source of the Audio/Video. 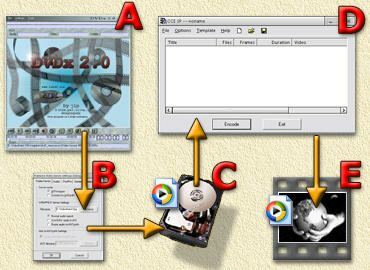 This is typically your Video-editing or conversion application, for example DVDx, FlaskMPEG, Adobe Premiere, and basically any other application capable of supporting Adobe Premiere plugins or Windows Codecs. The plugin allows the export of your Audio/Video data stream to a so called AVI wrapper (ie. the "frame" server - serving the individual movie frames of/to your application). This plugin can be downloaded at VideoTools.net and is shareware - not really crippled, just a buildin delay. Donate a small amount of money and the delay will be removed. Optionally this can be the AVIWrapper codec in situations where the application does not support Premiere plugins. The application that converts the Audio/Video stream to the desired format. For example TMPGEnc or Cinema Craft Encoder for converting the data to MPEG1 or MPEG2. Or Virtualdub for onverting to any of the available Audio/Video codecs on your PC (although some versions do not support the Divx ;-) 3.11 codec). The Audio/Video file you where going for. So why and when should I use this? Your favorite encoder cannot be used as a plugin for you A/V application. For example: I found DVDx to have problems with the CCE encoder plugin, there simply is no Premiere plugin for this encoder. You do not want to first save a huge file on disk. Which you afterwards convert with your afvorite encoder. How to install the VideoServer? First of all: download the latest version from VideoTools.net. I didn't put the files at WeetHet as the constant development of this tool makes it hard to keep the most recent version available here. You should be looking for Premiere Video Server Plugin (with installer). The plugin is distributed in two packages, one with a installer and one without. I personally would go for the full installer as it makes life a lot easier. If you have the package with the installer you can run the setup.exe and follow the instructions of the installer. But you can also do the installation by hand. Tip: make sure that before starting with the installation, you delete the old files of previous VideoServer installations!. Detailed information can be found in the readme.txt of the plugin package. The installation for FlasKMPEG or Xmpeg is done by just copying the videoserver.cm.flask (or videoserver.cm.Xmpeg) in the same directory as the FlasKMPEG or Xmpeg executable. The installation for DVDx is basically the same, copy cm-videoserver.prm to the application directory of DVDx, you also have to move the CM-avisynth.prm into the directory of DVDx. For Adobe Premiere you need to move the cm-videoserver.prm to the plugin directory of Adobe Premiere. (...\Premiere\Plug-ins). For all these alternatives: The plugin is automatically detected and loaded when either of these application start. So if you had one of these applications running during installation: shutdown the application and start the application again in order for the application to find the new plugin. If you want to use one of the following new features of the plugin, you need to copy these extra files in the same directory as the plugin. Inside the zip-file of the Premiere Video Server plugin the AVIWrapper client codec is also present. Before you start installing a new version you need to remove the old wrapper codec. The new wrapper codec can be installed by extracting the aviwrap.dll and aviwrap.inf from the package and running the install-script aviwrap.inf from for example c:\temp. (Right-click the file, and select install). The main purpose of the AVIWrapper codec is to support applications that do not support Adobe Premiere plugins! Final note: The plugins have been tested it on Windows 9x, NT, Windows 2000 and XP. So this should be no problem. If you would like to see how to use this plugin with for exampe DVDx and CCE, then please take a look at the guides available at WeetHet.